Many people get accommodations that include some kind of ‘kitchen’ set up. It may be something as simple as a small fridge and microwave or a fully equipped kitchen. And, one of the reasons people like this is so they can save money in the parks by eating more meals in the room, or out of a bag in the parks. While there are many stores nearby where you can go to get your supplies, you don’t always plan to drive when staying at Walt Disney World. 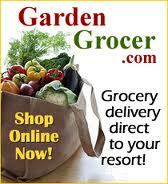 That’s where the specialized service offered by Garden Grocer may come in handy! This service is one of the nicest things we have experienced on previous visits to the Vacation Kingdom! There is a $40 minimum order and the items are slightly higher priced than the neighborhood outlet, but the convenience of having it delivered to your resort for the small amount of $14.00 can save you valuable touring time, while helping you stock the ‘kitchen’! They have a variety of items to select from for every dietary need, fresh fruit, dairy products, and water. If you want to use this service just go to http://www.gardengrocer.com, by email at info@gardengrocer.com, or call the toll free phone number 866.855.4350. Put your order together, designate which resort you are staying at with an approximate time of arrival, and they will deliver your order to that resort just prior to you arrival. AND, they will call you to confirm the delivery, so you will know it’s waiting for you! And, don’t worry about the refrigerated items, all Disney Resorts have the ability to keep things cold until you are ready to have them in your room. That’s it for today, I hope you find this to be a helpful post!